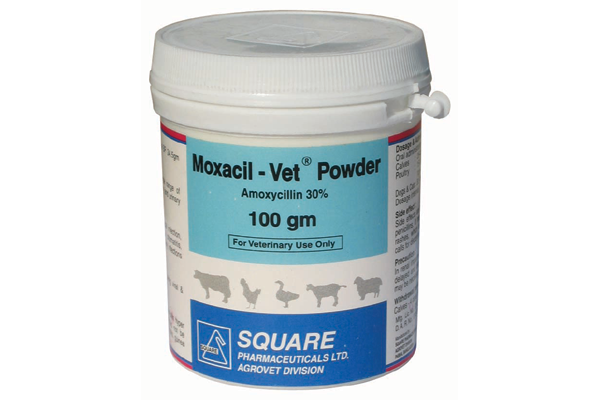 Moxacil-Vet® Powder is indicated in wide range of infections of respiratory tract, GI tract, Urinary tract etc. 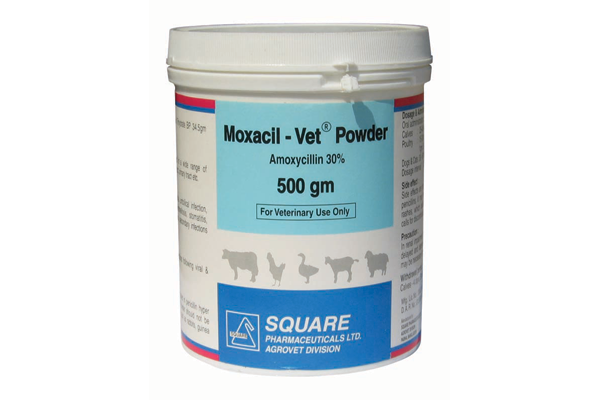 Specific Indication for Poultry: Enteritis due to E. coli & Clostridial infections & infection caused by Staphylococci, Streptococci, Corynebacterium, Clostridium, Fusiformis spp. E. coli, Klebsiella, Shigella, Salmonella, Proteus, Brucella & Pasteurella & secondary infections following viral & mycoplasmal infections. Poultry: 15-30 mg / kg b. wt. or, 1 gm / 3-5 litre drinking water for 5 days. Calves: 25-45 mg / kg b.wt. for 5 days. Dogs & Cats: 30-60 mg / kg b. wt. for 5 days. Fish & Shrimp : 50-60 mg / kg fish for 5-7 days.